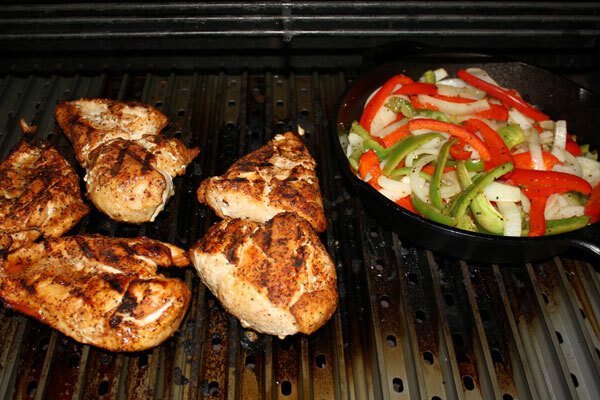 Texas Style Fajita Recipe - home style grilling recipe using beef or chicken and traditional ingredients. 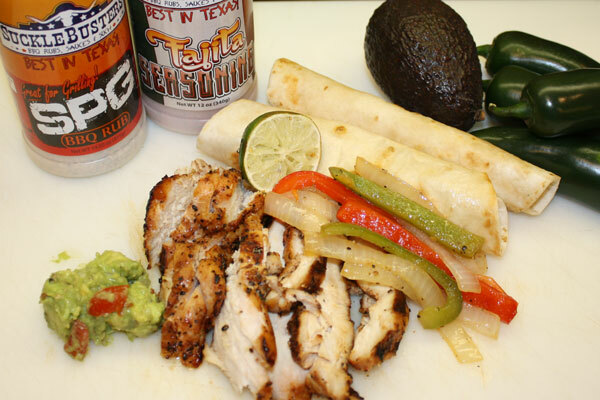 Classic Texas Style Fajitas! Make this classic Texas Style Fajita recipe using chicken, beef, pork or any meat on your grill. The key to great fajitas is to marinade/cook the meat and the vegtables seprately, then assemble including the optional toppings. Also, using warm tortilias cooked on a griddle will greatly improve the flavor of these fajitas. Note: Substitute any type of meat, for beef fajitas use 2 lbs tenderized skirt steak. Marinade the chicken: Rinse and dry the chicken breasts, then put into a plastic bag. Add approx 1/4 cup of soy sauce making sure the chicken is well coated, squeeze out any excess air and seal the bag. Place teh bag in your refridgerator and allow the chicken to marinate for about 1 hour and up to overnight. When ready to use, remove the chicken from the plastic bag and place in a deep sided dish or pan. 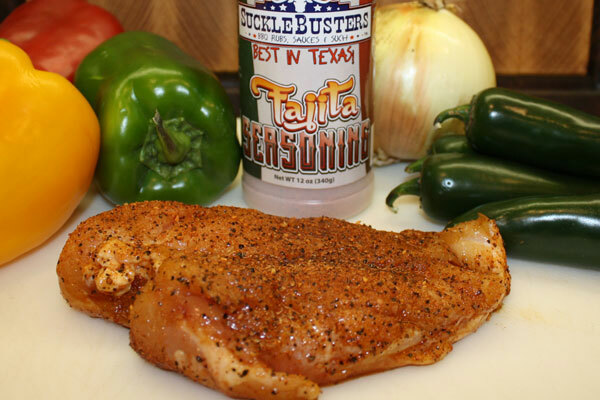 coat both sides of the chicken with SuckleBusters Fajita Seasoning. The chicken is now ready to grill. Marinade the Vegtables: The goal is to keep this marinade simple and let the fresh flavors of the vegtables shine through. Slice the bell peppers and onion in 1/4 inch or less rings and place in a cast iron (or other pot sutable for the grill) skillet. You can add any type of peppers or onions to this recipe. Lightly cover the vegtables with olive oil and 1 tablespon of SuckleBusters SPG (alternatively use salt + pepper + garlic). Squeeze on 1/2 of the lime juice and allow the vegtables to rest while the grill is warming up. Grill the chicken and vegtables on medium-high heat: Simply grill the chicken and vegtables untill done, stirring the vegtables to prevent burning. Caution, use extra thick hot pads when handling the skillet, the handle will be super hot. The juices in the chicken will run clear and the vegtables will become translucent when they are done. Remove and squeeze on 1/2 lime onto the chicken, reserve for assembly. Slice the chicken, assemble and serve: We prefer using warm flour tortilias - cooked on a flat top with a lttle butter. Slice the chicken breasts into thin strips then add the vetgtables and other fixins to complete. Most often used are; shredded cheese, guacamole, salsa and sour cream. Roll up, serve and ENJOY! 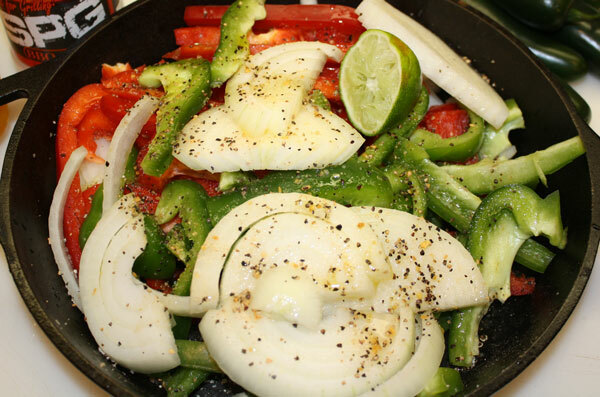 - Add 1 or more finely sliced jalapeno peppers for an extra kick of flavor and heat. - Warm the flour tortilias on a griddle with small amout of butter. - Dont skimp on the extras - try different types of salsa, fresh guacamole and cheeses for extra favor.